This spring (2016) Petzl arranged for me to come into a new anchor tether called the Connect Adjust. It's a sleek and modern alternative to the PAS/Chain Reactor/Runner setup's we commonly see and use while rock and ice climbing. The Connect Adjust differs in that it is primarily made of Petzl's 8.2mm Paso half rope. That's right, a dynamic personal leash system. While it doesn't come pre-made with a rappel extension system, one can simply clove hitch the rappel carabiner into the length of the Connect Adjust. This provides a secure rappel extension, and leave room for the friction hitch back up of you choice to connect to the belay loop. All of this said, I am not the kind of guy who enjoys extra gadgets and trickery. However skeptical I might have been, has been put to rest after 5 days of use. I like this thing. In Use: Girth hitch the sewn end of the Connect Adjust to your harness. 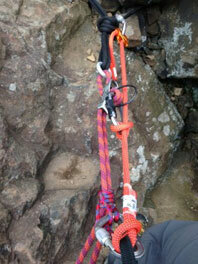 (This follows the Petzl's instructions). Carry the Connect Adjust on the haul loop of your harness. Deploy the tool as you need it. You can bundle it up nicely and you won't even notice it's there. Other Notes: Petzl pictured this Connect Adjust with an AM'D Carabiner. In my experience, it works better with the older style. The connection seems to run smoother over the round/square stock surface as compared to the newer H-frame style construction that Petzl has moved to. There is no advantage with out disadvantage: The advantage is the tool and it's energy absorbing qualities. The disadvantage is now you have to carry more stuff. I also secretly wish it was 16 inches longer! Editors Note: Petzl also offers a Dual Connect Adjust, featuring one fixed arm and one adjustable arm. It lists for $59.95. Conclusion: I feel as if I spend an hour a day cleaning anchors at work. I really like the ability to arrive at the anchor, clip in, adjust myself to the desired length (so I can't fall off), de-rig the rope, rig the rappel to my clove hitch, and descend. The Direct Connect makes this process easy, plus the added benefit of the dynamic connection feels good and helps put my mind at ease. Matt is the founder and director of Ragged Mountain Guides. He holds several AMGA certifications including Certified Rock Instructor.